Recently there was an amateur art contest in the Netherlands, and people were invited to create a work of art depicting the current era of multiculturalism in Europe… a depiction of their experience in the modern melting pot. 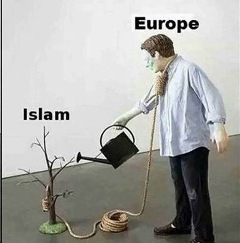 This art piece sums it all up…The Euros will regret letting in millions of Muslims to leach off their generous welfare systems, and then still foment terrorism against the very same people who are their hosts. Look at the wining art carefully and let it sink in. It is quite profound!!! I’m from the Utica, NY area. Utica is the city nicknamed by the UN “the city that loves refugees!” Soon every American city will be a city that loves refugees! Get ready! Good. I hope they win a massive settlement and drive them all out of business. Each one has been cutting off its platform to foes of jihad terror. In February, referrals from Facebook and Twitter to Jihad Watch dropped by 90% and have never recovered. jihad, only results whitewashing Islam’s links to terrorism come up. Meanwhile jihad terrorists, as is clear from this case, have free rein. These monopolies need to be broken up, and the sooner the better, as they are actively working against the freedom of speech. Through a trio of search warrants, the Department of Justice is demanding Facebook hand over the personal information of potentially 6,000 of its users. A New Jersey township that was sued by Muslims for refusing to approve a massive mosque project is returning to court because of a settlement agreement that restricts speech regarding Islam. Is the State Department Buying Arab Propaganda? “Politically incorrect” language has been censored by the State Department, the Department of Justice, the FBI, the Department of Homeland Security, the previous Executive branch, and, most recently, the National Security Council, which recently seems to have purged the entire department. John Kelly’s personal cellphone was compromised, White House believes. Look at this group you will not believe it. The virus of anti-American NFL anthem protests is mutating. Poland is a Christian nation and they plan to keep it that way! Gives me a glimmer of hope for the Catholic Church (at least in Poland!). people… who are a security risk and whose desire it is not to integrate but to destroy European culture?” — Andrej Babis, candidate for prime minister of the Czech Republic. Footage of Las Vegas Shooter Stephen Paddock at an Anti-Trump Protest? NBC REPORTER Tries to Get Vegas Shooting Victim to Trash Trump…WhatHappens Next Destroys The Fake News Narrative! [Video] https://100percentfedup.com/nbc-reporter-tries-get-vegas-shooting-victim-trash-trump-happens-next-destroys-fake-news-narrative-video/? Why is there no motive for the Vegas massacre? Why did Stephen Paddockhave a secret life? Alex Jones breaks the news as he receives it live on air: the hostage rescue team responsible for ending the shooting spree found ANTIFA literature in the shooter’s Las Vegas hotel room.